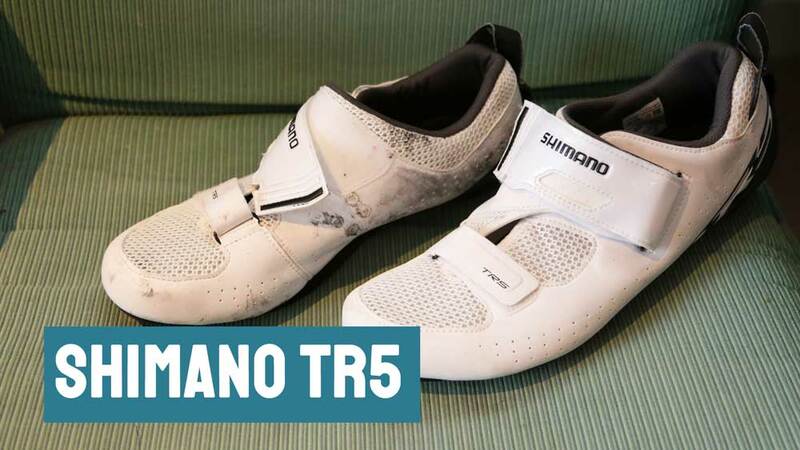 The TR5 is a triathlon cycling shoe from Shimano. In this video, I’ll review and it and show you what it looks like while cycling. What exactly is a triathlon cycling shoe? It’s a lot like a regular bike shoe. But it has some modifications specifically designed for triathlon racing. First, it has a mesh in the bottom to allow water to drain out. They’re also comfier than some bike shoes. This allows you to come straight out of the swim and jump on the bike without having to dry your feet or put socks on. They come with a loop at the back of the shoe that allows you to rubber band it to the back of the bike, keeping the shoe the correct way up. Finally, the velcro strap opens outwards to allow the shows to remain on the bike without the strap getting caught in the chainring. This does mean the end of the strap can rub against the crank arm so you may have to trim this down once you have worked out how much strap length you need for your foot. The TR5 is the smaller brother of the high-end TR9. It’s not clear what additional benefits the TR9s provide, though, other than coming in blue. The TR9 is only road cleat compatible, whereas the TR5 supports both road and SPD (mountain bike cleats). They’re not inset, though, so whichever one you choose you will end up walking like a duck. Not a problem if you keep the shoe on the bike in transition, though. The sole is very stiff, as you would expect from a road-style shoe. There isn’t much weather protection on top, which makes sense given they are built to let water drain out of the bottom. They come with two velcro straps. Once you have the first one dialled in you will probably never need to touch it. 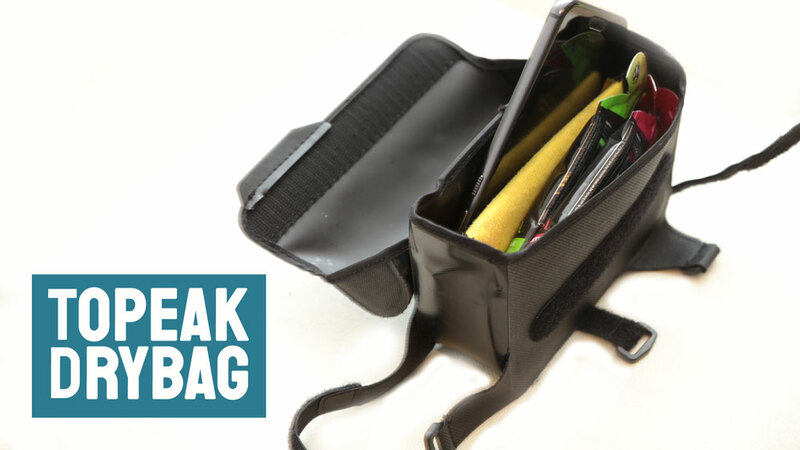 The Topeak DryBag Tri-bag is a top tube bag designed for triathlon, or anyone else looking to add some additional storage to the top tube of their bike and keep the contents dry in all conditions. In this video, I’ll review it and show you what it looks like when cycling. The bag is easy to install. It has two velcro straps underneath and one that loops around the stem. It doesn’t sit flush on the top tube, though, unless you’re willing to be really generous about looping the front loop around the steering column. It is easy to access on the move. Closing is easy if you just want to pin the thing down, but can be a bit more difficult if you want to get all of the straps in place. This is due to the heavy duty waterproof top that seems to do the job well. Another trade-off for the waterproofing is that there is no easy way to get a cable out if you want to stick a power pack or phone in there. Because it is so tall it can get in the way of you. This isn’t a problem for me when I am sat down, but it does tend to get in the way when I start climbing or sprinting out of the saddle. That said, it doesn’t annoy me enough to do anything about it. In terms of space, it is pretty limited. It is just about big enough to fit an iPhone 6 / 7 in there, but not if you have a cover on it. I do so that rules that out. It’s just about long enough to fit an energy gel in there, so I typically fill one side with 3-4 gels and the other side with a power pack for my phone. Overall, I think there are a fair few drawbacks to this bag. But, it has successfully served its purpose so far, so it hasn’t annoyed me enough to replace it. 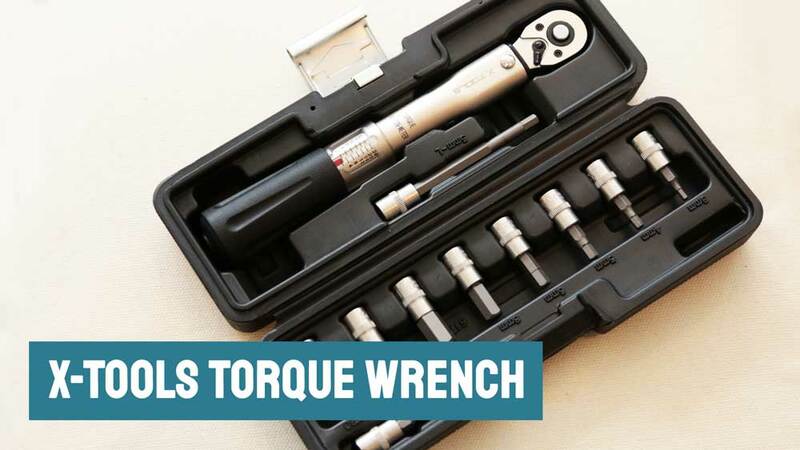 The X-Tools Essential Torque Wrench Set is an affordable torque wrench sold by Wiggle, formerly under the Lifeline brand. In this video, I’ll review it and give you a quick tutorial as to how to use it on the bike. 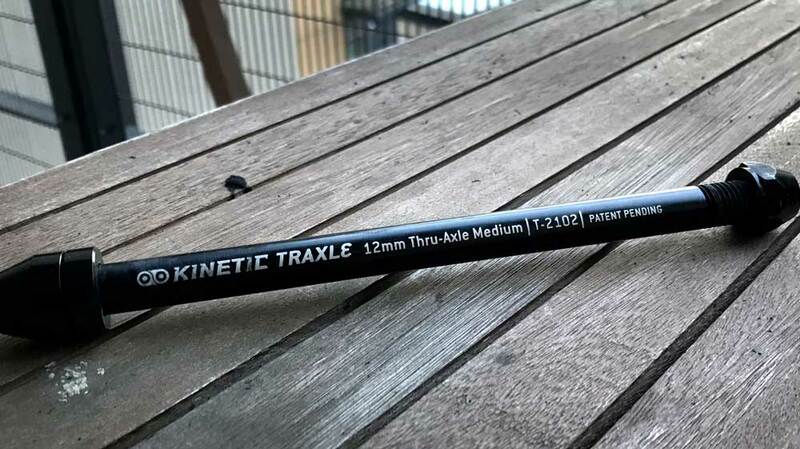 You need a torque wrench to get the correct tightness on your bike. With cheaper bikes, this isn’t a problem. However, if you have a carbon frame bike, you’ll probably find little stickers everywhere saying 6NM, or something similar, which typically indicates the maximum pressure you can safely apply. This is when you want to use your torque wrench. It supports a range of 2 to 24NM and comes with ten different heads that can easily be swapped in and out. The smallest being 3mm and the largest being 10mm, with some other style heads, included, too. It all comes in a custom case that allows all of the heads to be clipped into for easy storage and to avoid losing them. The level of torque is applied by twisting the handle. Don’t forget to take almost all of the torque off (take it down to about 2NM) before storing it. The Shimano PD-EH500 is a combination bike pedal that comes with SPD cleats on one side and flats on the other. It’s similar to the Shimano M324 but comes in a slightly different design and colour. In this video, I’ll review the pedal and show you what it looks like on the bike. The SPD side is a standard mountain bike clip, with adjustable tension so that you can control how easy it is to clip in and out of. By default, they come quite tight so you will probably want to reduce some of the tension before using them. The colour is dark grey. This suits most cranksets better than the metal look of the M324. However, it should be noted it is suitably different from black, so will still look slightly different if you get your eyes up close. And the clip itself is pedal. The flats side provide a fair amount of grip. Each pedal comes with six screws that you can insert into the pedal to give your shoes something else to grip onto. I like these pedals. They have replaced the PD-M530 SPD pedals I had on my bike as I found I did want to ride flat when I was just popping down to the bike shop or over to Parkrun. And they still look pretty cool. 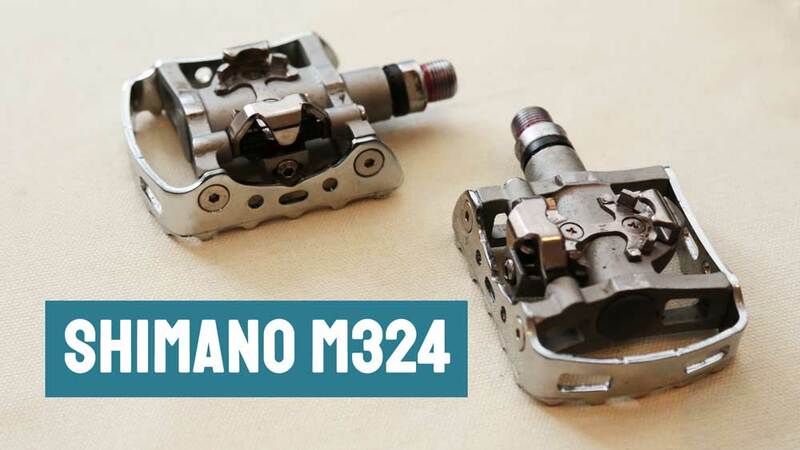 The Shimano M324 is a combination bike pedal. They have SPD cleats on one side and flats on the other so you can choose whether you want to ride clipped in, or whether you just want to stick your regular shoes on for those shorter commutes to work or Parkrun. This does mean that you need to put your foot down on the correct side of the pedal. But it is fairly easy to spin them around to the other side if you find yourself on the wrong one. They’re unpainted metal colour, which doesn’t fit with all bikes. You can adjust the tension on the pedal to make it easier for the cleat to clip in and out of. Typically, they come from the factory with lots of tension on so you will probably want to take some of that off before using them. They come with a pair of SPD cleats, which I believe are the ones that allow you to twist your foot either way to unclip. If you prefer a single direction for unclipping, you’ll want to swap these out for Shimano’s black SPD cleats. I’ll also show you what they look like on the bike. But I won’t be riding it because that bike doesn’t have a saddle at the moment: poor planning on my part! These are a great beginner pedal for those looking to try clipless pedals for the first time. 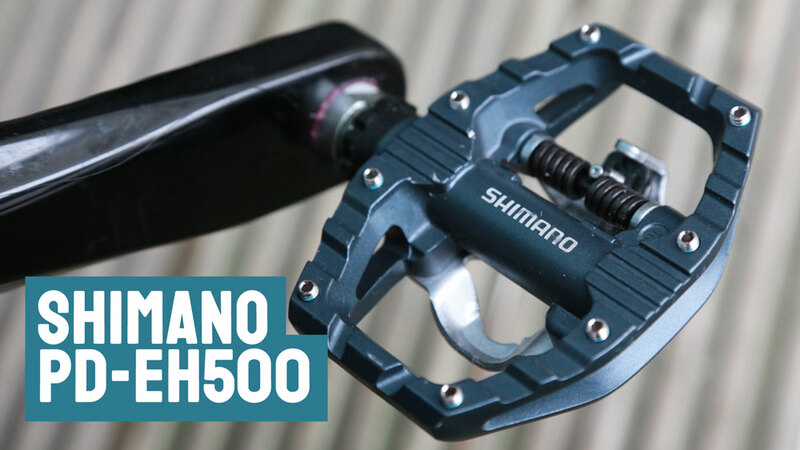 If you are considering these, you should also consider the Shimano PD-EH500 pedals. They are another hybrid/combination pedal but a slightly different design and colour. I have a video review on those, too. Earlier this week, I did Leeds Bike Mill‘s introduction to bike maintenance course. It’a four-hour evening session to teach you the basics. Leeds Bike Mill is based in the same building as the Peddler’s Arms, a drop-in bike workshop that is community run. It met my expectations: it wasn’t as clean and polished as the Evan’s Fix It course, but it was far more hands on. That is far more valuable than watching someone else do it. So, even though four hours seems a long time to change a tyre, do an M check and fiddle around with the brakes, it’s sort of understandable where that time went. We also covered gears, which both Evan’s and Woodrup didn’t really do, so it was nice to take a look at that because gears are always my biggest problem on the bike. Unfortunately, I didn’t get time to do any adjustments in the workshop itself and on the way home my chain fell off. Still, a chance to ride my old bike has eliminated any buyers remorse about the one I am riding now. All in all, I would recommend if you want to cover the basics of bike maintenance. 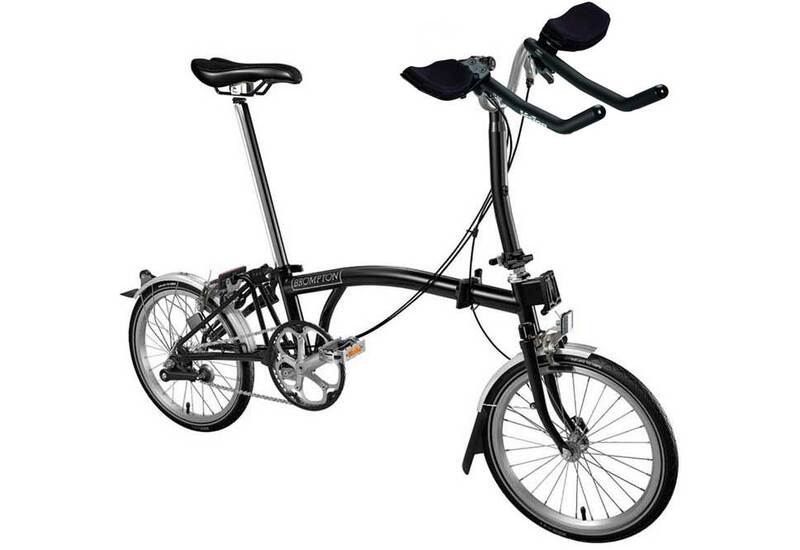 Brompton, the company famous for making folding bikes that you can take on the train with you, have this week announced they are releasing their first TT (time trial) bike with integrated folding aero bars. The new bike could also help commuters running late, allowing them to sacrifice the safety of themselves and pedestrians in order to shave a few seconds off the cycle leg of their journey. On a previous ride to Eccup Resoviour, Google Maps took me on a “public footpath” that was more bog than path and involved me having to shoulder my bike over several fences. But it gets worse. After I had traversed this valley of rubble, I then had to ford a river. 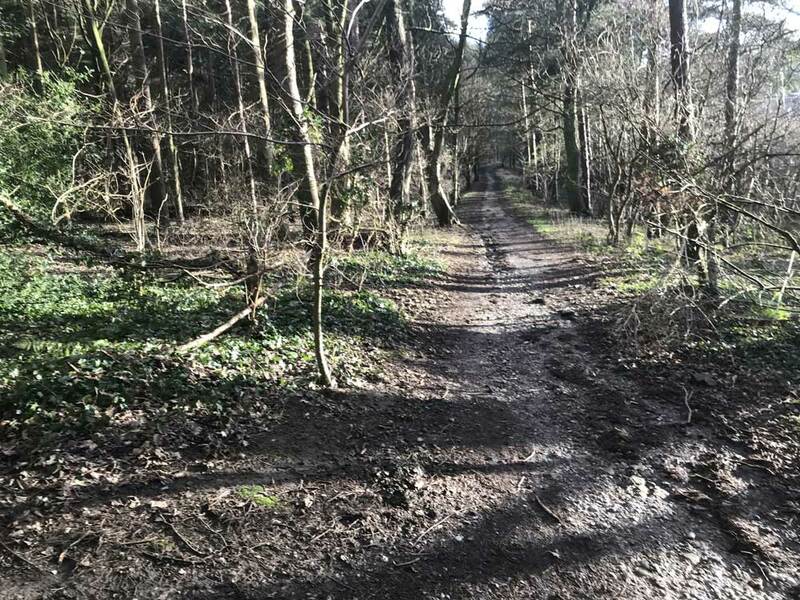 I checked to see if I could tell Google Maps to avoid routing me on public footpaths and keep to actual, real roads. But there isn’t. It’s really a poor experience on their part. On my Garmin sat nav, I can view the map without inputting a destination, and it will automatically move the vehicle and re-centre the map as I drive. Google Maps won’t let me do that, either.